Best Shampoos for Puppies , Tearless, Organic, Natural & more. 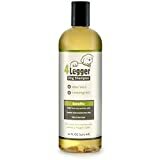 Home » Dogs » Dog Shampoo » Best Shampoos for Puppies , Tearless, Organic, Natural & more. When you have a puppy taking care of it is the foremost thing on your mind. You think about what kind of food to feed them, what shots or treatments they need and training them properly. You also need to groom them properly. This means choosing the right shampoo for them. If your puppy is very young, you don’t have to worry about bathing them. For the first three months of a puppy’s life, their mother cleans them and they won’t (and shouldn’t) be bathed with any type of shampoo. However, once your puppy is over 12 weeks old, you can bathe them as often as necessary using the best shampoo for puppies you can find. In order to do this, compare available products and pick the one that will best suit you and your pup. To help you do this, some of the best puppy shampoos have been analyzed and reviewed. Read through each review and see if any of them fit your needs or use the information presented to do your own comparisons of other shampoos. While some might tell you that you can safely use a normal dog shampoo on your puppy, it really isn’t a good idea. A lot of dog shampoo made for adult dogs are stronger in terms of potency and sometimes in fragrance. This might cause irritation and allergic reactions in puppies since their skin is softer and more sensitive than fully developed dogs. Similarly, some of the regular dog shampoos are medicated. These are definitely too strong for your puppy and should be avoided unless recommended by your vet for a specific problem. Puppy shampoo is better because it tends to be tearless and won’t sting their eyes. Your puppy has a different pH level and you have to keep that in balance. Using quality, gentle shampoo on them is always the best bet. This is why you cannot use a dog shampoo on puppies. Shampoos made specifically for them are guaranteed to be gentle and safe for their delicate skin. How Often Should You Bathe Your Puppies? While it might seem like an inconvenience to buy shampoo for puppies, especially if you have an older dog and already have a shampoo for them, it’s beneficial to buy it. Other than specifically being made for the pH level of a puppy’s skin, puppy shampoos have other benefits that shouldn’t be overlooked. Puppy shampoos are typically formulated to lather easier than other shampoos. This is done to speed up bath time since puppies are less patient than older dogs. It also allows you to use less shampoo during each bath which will decrease the likelihood of irritation. Puppy shampoo also rinses off easier than other formulas to ensure that no residue is left on your dog’s skin and coat. Since puppies have a tendency to get into mischief, most puppy shampoos also tend to have active deodorizers in them to help stinky puppies smell fresh again . Be sure that the shampoo you buy uses natural ingredients to produce its fragrance instead of artificial perfumes which might be too harsh on sensitive puppies. Similarly, quality puppy shampoos will clean your puppy effectively ensuring that no dirt is left on their skin. This will help keep bacteria from growing and causing infections and will keep pests off your pet. When looking for the best shampoo for puppies, there are certain qualities you should look for to ensure that you’re getting the best possible product and not a cheap, useless item. By knowing what to look for in a puppy shampoo, you can always feel confident that you’re making an informed purchase decision that will benefit you and your young dog. First, the best shampoo will be one that takes care of your individual puppy’s needs. For example, if your puppy has sensitive skin, you’ll want to get a shampoo that is made for puppies with sensitive skin. Or, if your puppy has a flea infestation, you’ll want to get something that is made to treat that issue. Read the labels of the shampoos available to you and narrow down your choices to those that are made specifically for any issues your puppy has. You should also consider the type of ingredients you want the shampoo to have. Since most puppies have sensitive skin due to their young age, looking for a shampoo with all-natural or mostly natural ingredients or organic is always a good idea. The less chemical ingredients a shampoo has, the less likely it is to cause adverse reactions to your puppy’s skin. If you see that a shampoo you’re considering has a lot of chemical ingredients or, worse, doesn’t list the ingredients at all, it might be best to choose another product that discloses their ingredients or uses gentler components. The best shampoo for puppies should also be effective for cleaning your dog. Unless treating a specific problem, like a pest infestation, you likely just want to get your dog looking and smelling fresh. Be sure that the shampoo you choose will cleanse their skin and coat properly, rinse off well, and leave them smelling fresh (not artificially perfumed). When shopping for a puppy shampoo you should also make sure that it fits your individual budget. The pet supply market is a booming industry with pet owners spending more and more money every year. For this reason, there is a wide price range for supplies. You can find cheap shampoos made of questionable ingredients, high-end shampoos by the top supply brands, and inexpensive, high-quality puppy shampoos that work well and are budget-friendly. All in all, you want to make sure that the shampoo you use for your puppy is effective, affordable, and safe to use. If you’re buying a brand name shampoo, the likelihood of it being all of that is higher than choosing an off-brand product with questionable origins. This is why it’s important to not only read labels and product descriptions of shampoos but to also do a little research and see what users have written in reviews regarding the product. Doing so will give you a good idea of what to expect if you were to buy that shampoo for your puppy. You should also consider talking to your vet or your groomer and get their professional recommendations. No matter what shampoo you end up buying for your puppy make sure you always follow the product’s instructions and make sure you rinse it off thoroughly. It’s also recommended that you introduce any new product to your puppy slowly at first. Your puppy is sensitive and might not like new scents and sensations. By allowing them to get used to a new shampoo slowly the better they’ll handle bath time. Finally, stick to shampoos made for puppies instead of normal dog shampoo and never turn to human shampoo to bathe your dog. All shampoos aren’t created equally. When buying a new product, be sure to read the labels as there are ingredients to avoid in puppy shampoo. This is due to their sensitive skin but also because the shampoo can get into your puppy’s mouth and make them sick. Dangerous chemicals can also seep into their skin and cause internal damage that can lead to things as serious as cancer over time. You should also avoid artificial fragrances and dyes, soaps, sulfates, and parabens. It’s important to remember that the law doesn’t require pet supply companies to list their ingredients so doing research on a product is important in order to find out what you’re using on your puppy. There are some ingredients that can be found in quality puppy shampoos that make them better than other products. Choosing products that use those better quality ingredients can increase the effectiveness and beneficial nature of your puppy shampoo. These ingredients are natural ones that are less likely to cause irritation or allergic reactions. Each one of these ingredients has properties that make them natural cleansers, deodorizers, and soothers. Some of these ingredients even have natural antimicrobial properties that can work just as well as chemical antibacterial products. Puppies have their own set of bathing rules that you have to follow. The most important rule is that you shouldn’t be bathing your puppy until they are three months old. All grooming before that age will be done by the puppy’s mother. Once your puppy reaches three months old, you should bathe them whenever they need to be cleaned. Unless they’ve rolled around in mud or you notice an odor, most puppies will only need to be bathed once a month. If your puppy has a tendency to get dirty often, you can safely bathe them once a week but you shouldn’t exceed that frequency. If you bathe them this often, consider using a soap-free or very mild puppy shampoo that won’t strip them of their natural oils as much as other shampoos. When choosing the recommended frequency of bathing your puppy once a month you can keep their coat looking its best by brushing them between baths . Generally, brushing your puppy once a week will rid them of loose hair, debris, matted fur, and dirt. This will also help them stay irritation-free since any of those things can lie on their skin and cause itchiness or facilitate the growth of bacteria or fungi. Brushing your puppy will also help you spot any possible issues with their skin including pest infestations. A conditioner is an additional product that you can use on dogs to help make their coat softer, more manageable, and shiny. They can also help soothe dry, itchy skin when used after specialty shampoos thanks to the moisturizing ingredients that they are made with. Conditioners specifically made for dogs, especially ones designated for puppies, are safe to use on your pet. Be sure that you get a gentle formula and always stick to natural ingredients instead of chemical ones. If you can, look for a conditioner that is labeled “tear-free” or “tearless” to protect your pet’s eyes. Puppies are more sensitive than older dogs and are more likely to become irritated from stronger conditioners so the gentler the better. Some conditioners might have an age range on them. Be sure to stick to that range when using any product. If you’re concerned talk to your vet or groomer for their recommendation. Never use a human conditioner on your puppy. Your young dog has a different pH level than humans so using something made specifically for humans can throw off your puppy’s pH balance and cause problems including dry skin, rashes, dandruff, and excessive itchiness. 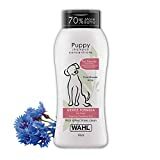 Now that you have a better understanding of why puppy shampoo is important and you know what to look for in a quality product, here some of the top sellers ones been reviewed and analyzed to help make your search a little easier. Known as one of the best natural dog shampoo companies, Earthbath makes a mild shampoo specifically for puppies. It will clean and deodorize your dog without any harsh chemicals. The formula is soap-free so it’s tearless making for a problem-free bath. The company itself prides themselves on making products that impact the planet as little as possible. Besides being all-natural, the product is also 100 percent biodegradable and cruelty-free. Since it’s gentle, it can be used for weekly baths if your puppy needs more baths than usual. Sometimes, puppies are difficult to bathe. If you have a puppy who is difficult to bathe, dry shampoo might help. These products don’t require any water making cleaning your dog a lot easier. 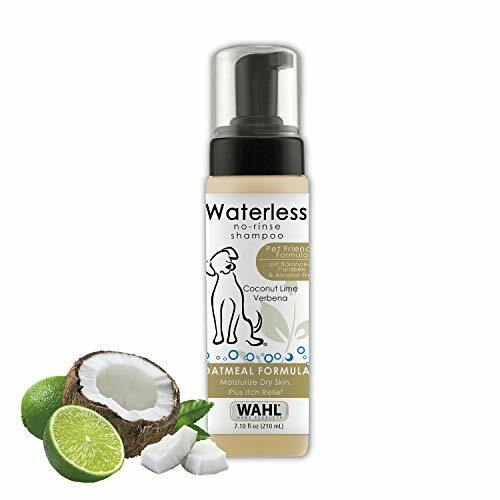 Wahl’s dry shampoo is a great, natural alternative to normal puppy shampoos. 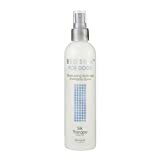 This is a plant-derived formula that is meant to deodorize your puppy while cleansing its skin and coat. Instead of the common spray that most people think of when they hear “dry shampoo,” this is a foam that you massage into your puppy to cleanse them. Since it’s natural and chemical-free, it’s considered safe for puppies over three months old. 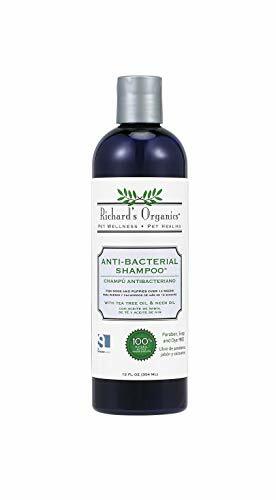 If you’re looking to treat a skin infection on your puppy, this is one of the safest antibacterial shampoos on the market. It’s made for all dogs but is safe to use on puppies that are over three months old. It can be used to treat fungal infections as well as bacterial infections and is backed by veterinarian recommendations. Even though this is an antibacterial shampoo, it’s considered gentle enough for puppies because it’s made of natural ingredients instead of chemicals. It uses the natural properties of tea tree oil and neem oil to effectively target the infection without harming your puppy’s skin. Since it’s made by SynergyLabs, a trusted pet supply company, you can be sure that it’s a high-quality product, too. For those of you looking for a gentle puppy shampoo that won’t break the bank, this Isle of Dogs shampoo is a perfect choice. This tearless formula won’t irritate your dog’s eyes during bath time making the chore a lot easier on everyone involved. It will also properly cleanse and deodorize your puppy without causing skin irritation. 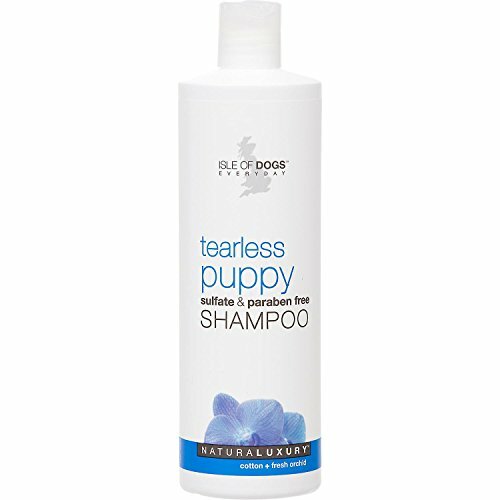 Due to the tearless formula, this shampoo is not just great for puppies but is also great to use as a face scrub for adult dogs. You can use your favorite shampoo on them and then use this on their face to avoid irritating their eyes. Safe for puppies, the Calm formula made by Rocco & Roxie is a natural shampoo designed to make bath time easier. It doesn’t contain any harsh ingredients and is considered to be hypoallergenic since the ingredients in it have a lower chance of causing allergic reactions in your pup. Besides cleansing your puppy, it will also smooth out their coat and stimulate follicle growth. 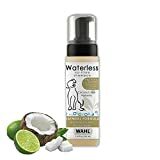 This tearless shampoo contains no alcohol, parabens, phosphates, or dyes making it safe for dogs with skin sensitivities, too. Instead, it features rosemary to cleanse and protect the skin, aloe vera to moisturize dry skin, and chamomile to calm any present irritation while also improving their skin’s elasticity and texture. While puppies are more sensitive than older dogs, there are still plenty of great shampoos that you can use to clean your puppy without causing harm to their soft skin. Remember, always keep your pet’s individual needs along with your own preferences in mind when choosing the best shampoo for puppies. Also, keep the tips from the buying guide in mind when looking at other shampoos that weren’t reviewed here. What shampoo do you use for your dog? comment below and let us know!